Do you love to fuse? Are you looking for a new challenge? Introducing "Fused Clasps" with Instructor Liz Jones. 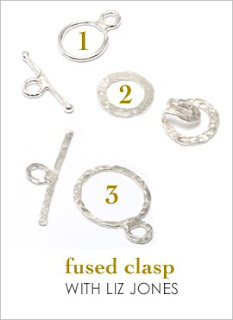 Liz shows how to create three different clasps in this class. You will learn to make two types of toggles and a multi-strand hook and eye clasp. We recommend having some prior fusing experience before tackling this class. Check out our Introduction to Fusing Class for some prior instruction if needed. And here is a new Wireworking class from wire guru Barb Switzer. 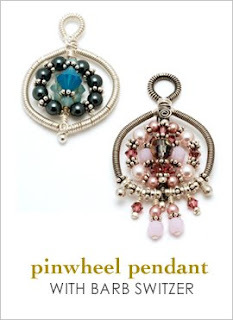 "Pinwheel Pendant" is the latest Beaducation class from Barb. In this project you will mix wire and crystals to make the perfect pendant. Barb guides you through this delightful design and offers many tips and tricks on wireworking. The resulting pendant can be incorporated into a finished beaded or chain necklace. Yay! Thanks for the new classes!! I'm just not all that into stamping, so thanks!